*This story was originally published by Red Letter Christians on May 24, 2018. What do I mean by GI justice? Besides justice in the strategic sense of civil rights, I also mean justice for soldiers and veterans (“GIs”) in principle, as in human dignity and moral agency. Let me share why these two elements of justice are distinct but interrelated, and how Red Letter Christians can support GI justice. Civil rights include both positive and negative legal guarantees, what we call rights. A positive right secures access to benefits of a democratic society, like equal employment opportunities or access to fair housing. Negative rights, on the other hand, protect people from physical or economic injury, like hate crimes or fraud and abuse. However helpful, rights aren’t perfect, since people with power can still wield their power unjustly, even if it’s more difficult than it once was to do so. We can’t legislate morality, unfortunately. Human dignity is different, and it’s even harder to enforce or protect. Legal frameworks generally work well against external forms of oppression, what moral philosopher Hilde Lindemann calls “deprivation of opportunity.” Internaloppression, what she calls “infiltrated consciousness,” is all the more insidious, because the harm occurs within the confines of a person’s mind. An infiltrated consciousness does not have to be told it lacks human dignity, because it has come to believe itself the lie of inferiority. All that is to say that justice is still incomplete even if it doesexist on paper. Even if veterans wereprotected from hate crimes, workplace discrimination, or harassment, justice is not complete if Americans continue to see military personnel as less than fully human. 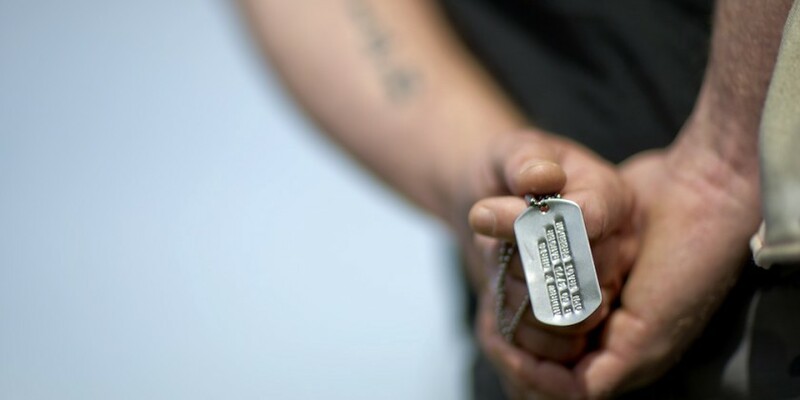 Soldiers and veterans continue to be spoken of primarily in terms of a diagnosis, and until we can correct how we stigmatize mental illness, that association infringes upon the full agency and dignity of soldiers and veterans. So what, right? Veterans have their VA benefits and entitlements. They aren’t oppressed or marginalized, quite the opposite — they’re venerated as American idols! I don’t disagree, but suggestions like that are misleading at best. After all, the other main way Americans talk about our military, besides through the lens of mental illness, is through shallow expressions like “Thank You For Your Service” (TYFYS). This is a problem because TYFYS is performative allyship; the expression satisfies something in the performer while providing little to no benefit to the subject, whose experiences and needs are minimized or ignored. TYFYS has become compulsory, as though some offense might be caused if it is notuttered, all despite a growing body of literature from veterans decrying the practice. The internalized oppression of “infiltrated consciousness” remains under the radar, because the victims disappear before the problem can rise to the level of public discourse. Would the #BlackLivesMatter or #MeToo movements have ever existed if victims believed the lie of their own inferiority? When oppression is successfully internalized, a mind infiltrated by the lie of inferiority sees a problem with just one solution. His words are telling, calling his own oppression a “system of dehumanization, neglect, and indifference.” Like other marginalized and oppressed people, he wanted freedom, self-determination, and to flourish as a human being. He was a good person, so he also wanted these things for his loved ones. He saw himself as the problem, so he solved …himself. The freedom he lacked in life was only attainable by removing himself from the world that his weary mind allowed him to see. Whether true or not, he came to believe it, because his very consciousness had become infiltrated by an oppressive force akin to racism and sexism. The real problem, however, is not soldiers and veterans, but a system that sends men and women to fight for freedom, only to come home to find themselves deprived of the same protections they’ve secured for others. The earliest Civil Rights soldiers were Black WWII veterans like Rev. Dr. Hosea Williams and Rev. Ralph Abernathy. A defeat in Vietnam and the public humiliation of an entire generation of veterans, who currently outnumber Post 9/11 vets almost 3 to 1 (6.9Mto 2.6M), proved that America was not above treating its own GIs like second-class citizens or worse. Williams and Abernathy could not have conceived that their Veteran Status could one day be the site of oppression just as much as their race or color, so they never pushed Rev. Dr. Martin Luther King, Jr. to include GI Justice as part and parcel to the struggle for civil rights. Civil rights can challenge the internalized oppression that soldiers and veterans have been trained to quietly endure, but they also need social justice warriors to fight for #GIJustice with them. Red Letter Christians can lead the charge to empower GIs by eradicating injustice in all its subtle forms, just as soldiers believe they are accomplishing by fighting overseas. The first step is educating ourselves, first by learning what military rights soldiers and veterans do and do not have, and second by understanding why Social Justice for Warriors is critical to their human dignity and flourishing. Luckily, these two topics are available as workshops on the GI Justice Tour, which communities, congregations, and organizations can book for a reduced Red Letter rate if they sign the pledge and add themselves to the Network Map! SIGN UP: Bring the GI Justice Tour to a city near you! If injustice anywhere is a threat to justice everywhere, then none of us are free until all of us are free. Freedom must never come through the barrel of a gun, no matter if it’s being pointed at victims of war, or its perpetrators.